The Manufrance company was started in 1885, and the first catalogue was published in 1889. This was France’s first mail order company with an annual catalogue, which was known as la Manu. It offered a wide range of products, the most famous being guns, bicycles and sewing machines. Its TSF radio, made in 1930, had an essential role during the German occupation of WW2. 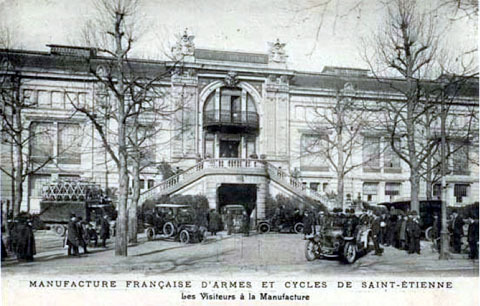 Manufrance was a pioneering company, based on a unique business model and, at least for the first half of its existence, was the leader in its field. La Manu pre-dates the American Sears-Roebuck Catalogue, so I assume it’s the oldest mail order catalogue in the world. With the wide range of products on offer each year, it now offers us a unique glimpse into French homes over an entire century. This early 1900s Manufrance Hirondelle is an older restoration, with some chips in the paint but overall in very good condition. The nickel is shiny, the saddle is excellent, metal wheel rims are new, and it’s fitted with a Corbin Duplex coaster brake. It rides very well. Its tall size – 25.5″ – is unusual for an early 1900s French bicycle. I’m not absolutely certain of its age, but the fork crown, front plunger brake, handlebar style and pedals are all illustrated in the 1903 Manufrance catalogue (extracts below). The company changed their chainwheel style regularly, and this one is not shown in the 1903 catalogue, so it could have been made a few years either side. The fact that it’s inch pitch suggests early manufacture. The company was established at Villebouef, Saint-Etienne, on 10th November 1885, by directors Mimard and Blachon for the manufacture of sporting guns and bicycles under the Hirondelle trade mark. Initially it handled the sale and repair of mainly British bicycles and tricycles. Own production of bicycles did not begin, and then only on a small scale, until March 1888. Against the growing trend for diamond frames the first catalogue in 1889 favoured the cross frame in the form of the Superbe. The frame was curved to absorb vibrations. In 1892 four models were offered: the 125 for artisans and workmen, etc and selling at Fr185, the 130 for postmen, bailiffs, road inspectors and messengers at Fr235, the 135 roadster for doctors and commercial travellers at Fr275, and the Superbe at Fr360. All of these were bought-in from the Gautheir Brothers* contrary to the claim in the catalogue to have been manufactured on the premises, and sold at a profit. A new factory was built in 1894 that was equipped with the latest machine tools. In 1895 bearings were introduced that could be stripped, cleaned and adjusted by hand. The range of bicycles and parts was simplified. The number of brazing operations was reduced, and the number of different bolts were reduced and standardized. The company emphasised the interchangeability of components. The Mimosa model was produced. The retro-direct gear was introduced in 1903. Two gears were obtained by means of two chains with a change of gear being obtained by pedalling in the opposite direction. However, these were never popular. Continual simplification and quality control saw sales increase to 12,000 a year by 1911. The company failed in 1940 as a result of the Second World War. * Gauthier Brothers: Pierre and Claudius Gauthier were mechanics who started to build their own bicycles from about 1886, having copied a Rudge. They were based in Blois, France. In 1887 they produced a model called La Militaire for army dispatch riders. In 1889 they exhibited a model which could be converted from bicycle to tricycle and to tandem tricycle. They were asked in 1891 to design three bicycles for Manufacture d’Armes et Cycles de Saint-Etienne.